Templates allow you to setup custom pre-filled reports to fill in the blanks when you get to the property, or set up the formats your or your clerks should work to. Navigate to Settings > Templates to add or edit templates for your account. Click Add Template to create your own template from blank. Templates can be automatically selected or recommended at the time of booking based on the type of inspection, property size and furnishing level. We've pre-loaded a couple of sample templates in to your account when you registered. You can edit these if you want, or create your own. To edit a template, click on the template name in the Templates list. You can create and configure an unlimited number of templates. Premium templates are available on Enterprise plans inclusive. When setting up Templates, we refer to sections or ‘rooms’ within a property as blocks. Blocks can be named as anything. Different Block Types provide different input formats. Room/block consisting of items with a text-based description and condition. Typically used in detailed inventory reports. Room/block consisting of items with a single text-based comment/condition (no description). Typically used for Schedule of Condition and Cleaning Summary. Room/block consisting of items with a Yes/No/NA toggle format, default toggles include Clean/Undamaged/Working but can be customised with up to 6 labels. Typically used for faster Inspection formats. Room/block consisting of line items with a single Yes/No/NA answer, typically framed as questions on Check Ins/Check Outs and Interim Inspections. Choose from 3 or 5 Star Rating Charts to indicate condition, entering a score of 1 to 3 or 5 for each item listed. Special room/block type for entering Meter Readings including Gas and Electric. Inputs for Meter, Location/Serial and Reading. Special room/block type for logging keys and a comment including description and handover notes. Special room/block type for logging electrical appliance manuals. 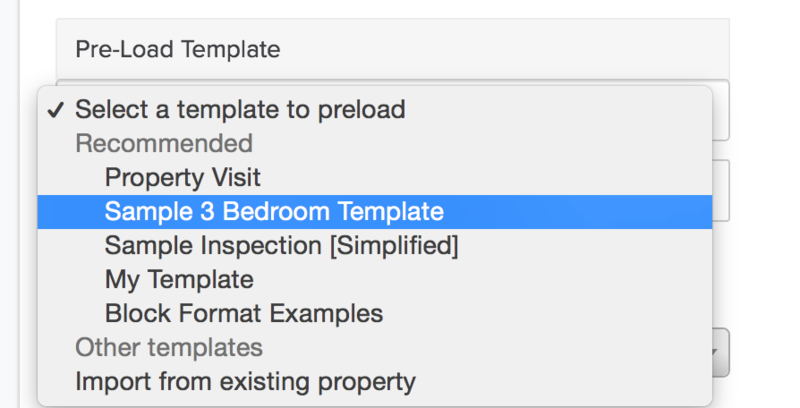 When you're adding an inspection, select the desired template from the Pre-Load Template dropdown and it will be automatically loaded to download to your App and work from on-site or fill in via the online report editor.